Yep, 790k and counting. I bought it in '93 with 175k well documented miles and full service records of all of them. I have kept detailed records of all maint and repairs as well as fuel burned and cost with fuel milage log. It has a life average of 21.2 mpg!! I have heard you have to keep adding diesel fuel additive to keep the older diesels running on the new formulation fuel, or you will damage the injector pump and the injectors. If you expect to make to a million miles you might consider the fuel additive. Just found this forum today. I have a 1988 Toyota Tercel Wagon with auto trans and 4WD. I believe the color is called "champagne" which is funny since it's a lofty color choice for such a simple car. I think beige would have been more appropo. People are astounded when they find out I bought the car new in 1988 and am still driving it today. Unless you've owned one of these cars, hard to explain how awesome they are. Besides having the best mileage of almost any other car around at the time (1988), the car feels solid. I've owned a VW bug (first car). I briefly had a Chevette that was new when I got it and it deconstructed itself in less than a few years - what a craptacular mess that thing was. After that, had two Volvo station wagons (a 63 with dual carbs and a 76 which I bought in early 80's) until I bought this car in 1988. I think my Tercel was one of the very last ones around for sale at the Toyota dealerships. I bought my Tercel because a friend of mine was dating a guy who was over 6 feet tall and he said it was the only small car he could fit in. I was looking to buy a new car at the time and he took me for a test drive and I fell in love with the car. I also loved that it's very simple looking -- kind of like a box on wheels -- and figured it would go relatively unnoticed in the car theft capital of the world (Los Angeles) but someone did try to steal it once. Luckily they were amateurs and just messed up the ignition and smashed a a couple of windows. My Tercel has been the most practical and reliable car I've ever owned. I did have an issue with the transmission which borked itself while still under warranty so that was replaced but since then, nothing major until I blew the engine. Blew the engine at around 140K and found another one -- AUC version from Japan with guaranteed 40K or less -- was installed in 2007 and have only put about 11K on it since. Unfortunately, I reside in an "enhanced" emissions testing area in CA. I passed the smog test two years ago but since then, CA raised emission standards again and am struggling to pass smog test. My mechanic, who put the engine in for me and has done all my work since, is working with me on trying to tune it up so it will pass. First smog pretest, Hydrocarbons, Carbon Monoxide and NO were too high and the oygen level was 4.0% -- we tackled the oxygen issue and on next test (below) the oxygen dropped to 0.1% (some hoses to the carb were cracked and needed to be replaced which fixed this problem) but a second pretest still shows a potential fail. I've been tracking down at various auto parts stores a carb cap & rotor, wire set, spark plugs and fuel filter, all of which I've found. After we do the tune up, my mechanic suggested putting in good quality gas (I've always used cheapest) and maybe a cleaning additive and then driving it on the freeway for 30-40 mins to blow out the crud. Hoping this will drop the Hydrocarbons and CM below the max limits. I love this car. I call it the world's biggest small car -- it looks small from the outside but inside, it's massively roomy. I love that the engine parts are visible and that it doesn't have a lot of unnecessary junk. And with this relatively new used engine, I should be able to keep it going another 100,000 + miles (as long as other parts hold out or I can replace them and keep it within the CA emmission standards). Was wondering if there's anything else I should know about to get the car to run cleaner and more fuel efficient. I don't want to have to pop for a new catalytic converter and I don't want to buy another car - can't afford one anyway. Can barely afford the tune-up. Was wondering if there are any other CA Tercel Wagon owners who have hit the "smog test" wall and if so, if you have any advice. And I certainly welcome advice from anyone else. Thanks and glad to have found this forum. You will find this is a very helpful group with very helpful and quite knowledgeable members. I owned a new '83 in late '82, so almost qualify. Re-entered the fold in 2005 (after 20 years) with Goldie. It's interesting that you owned a '63 Volvo wagon; member Petros and I each owned that era 122S (aka Amazon), albeit sedans. Or did you have the rare P210 Duett wagon? The latter had a PV544 front end ('46-8 Ford kinda look), but was built on a ladder frame. Member 4wdchico may have some pertinent advice, as he is in CA and is/was a qualified emissions guru. Thanks Archinstl -- Appreciate the info. Not sure what model the old Volvo was. I sold it to a friend and sadly, someone totalled it while it was parked on the street. Both my my 60's era VW and Volvo were amazing cars -- simple straight forward engines. If I still had either one of them in working condition, they'd be exempt from smog checks. May need to find a pre 75 vehicle (those are smog cert exempt) as 2nd vehicle to drive while I sort out my Tercel's smog stuff. You will find list member Tercel4wdrules lives in your area and has a lot of experience with CA emissions testing, he owns 5 of them! he has a similar go around with his cars so he might be able to help you with the emissions readings. But first thing you need to do is just make sure the engine is running properly and everything is on it working (vac lines, set timing to 5 deg, etc.). 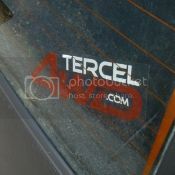 My tercel:: 1986 tercel 4WD. new hella driving lights, good mud and snow pizza cutters, driven by a Jedi! saltspring, you're just a stone's throw from me! welcome! where'd you pick yours up from? thanks man. picked it up on the island, $500. Tercel(s) owned and modifications done: 1987 Tercel 4WD Deluxe, AKA "neglectorino". Completely stock. welcome aboard, what this forum for PNW meets, we usually get together once or twice a year to go on a drive and have a BBQ. Car: 1985 Tercel SR5, Silver, just picked it up yesterday with absolutely zero mods. My project/commuter car. Needs a couple easy fixes. But so far it's great.